Between the World Cup, my son’s birthday, and all the crazy- end-of-school-year STUFF, I have not been blogging with my usual attention. And I have missed you! 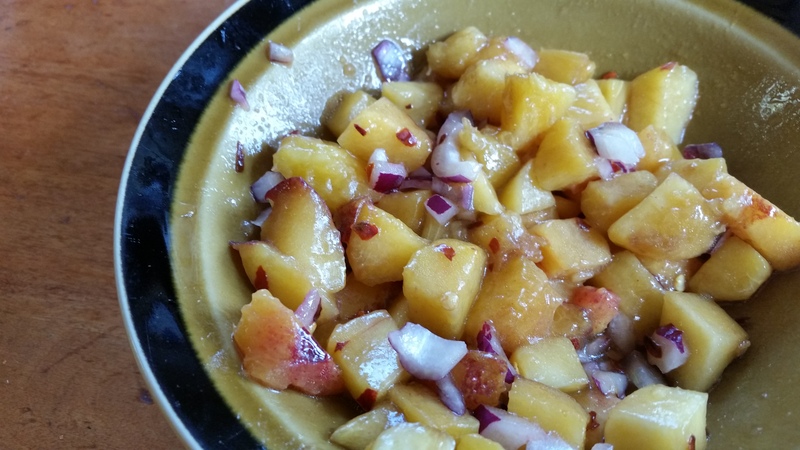 But in the last few days of entertaining and spectating, this peach and nectarine salsa (done quickly at half-time) has been sparking up the fantastic grilled chicken my dad has been charring to perfection. This is done in five minutes! Mix together in a bowl and let sit for at least 15 minutes. Serve with grilled chicken, shrimp or sturdy white fish. When it comes to camping food, go bold or go home is my motto. This is no time for subtlety. So, when Pedro (my dad) showed up at the campsite with some steaks last week. I was all in. 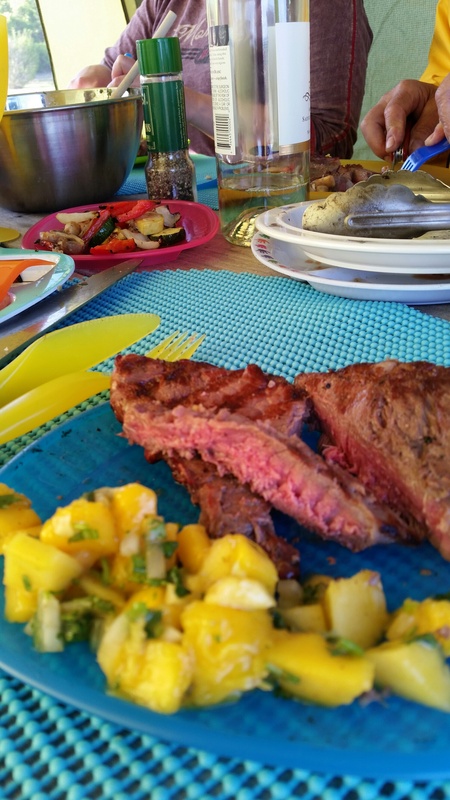 He simply sprinkled salt and pepper on the steaks and got to grilling. His hint for you today is that starting with defrosted steaks still a bit cold in the center helps to keep the rare in medium rare when things start moving quickly on the charcoal grill. A fair bit of marbling on a steak is desirable, because you want that fat to melt and season the steak as opposed to drying out a leaner cut. 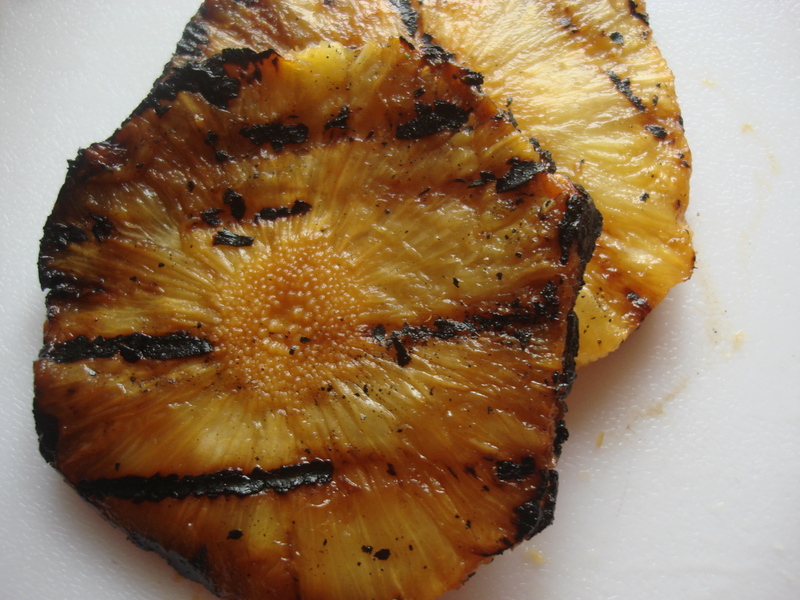 Grilled pineapple is one of the joys of summer grilling. 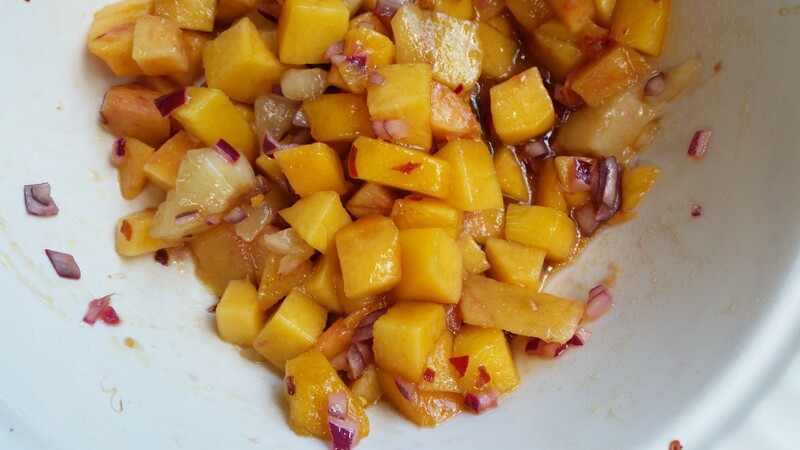 Searing thick slices of juicy pineapple brings out their sweetness and gives them a more rounded flavor.And when you have leftovers, you can dice them and add them to salsa for a sweet-tart surprise that marries so well with smoky, spicy chipotle and bright red onion,(you can use fresh raw pineapple too). This is what pineapple looks like off the grill. 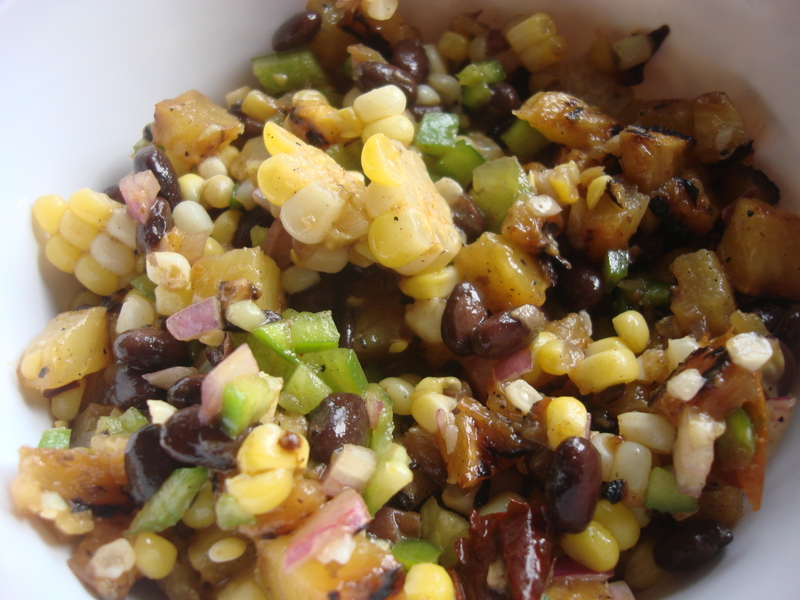 I also like to add black beans and corn kernels — both of which tend to be around in our summer kitchen. I made this a few weeks ago and forgot to take a picture until it was too late. 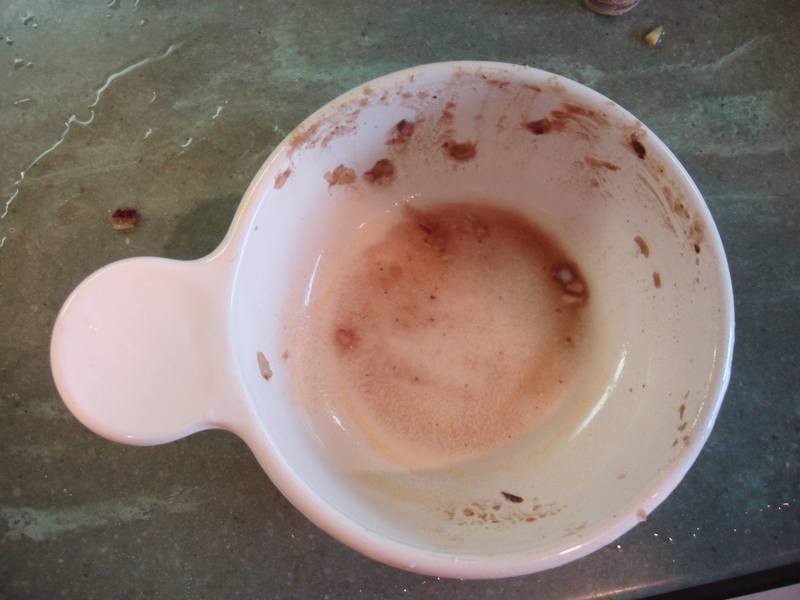 You can mix and match as you please and play with the proportions…this is basically a good way to use up an extra scoop of this and teaspoon of that. 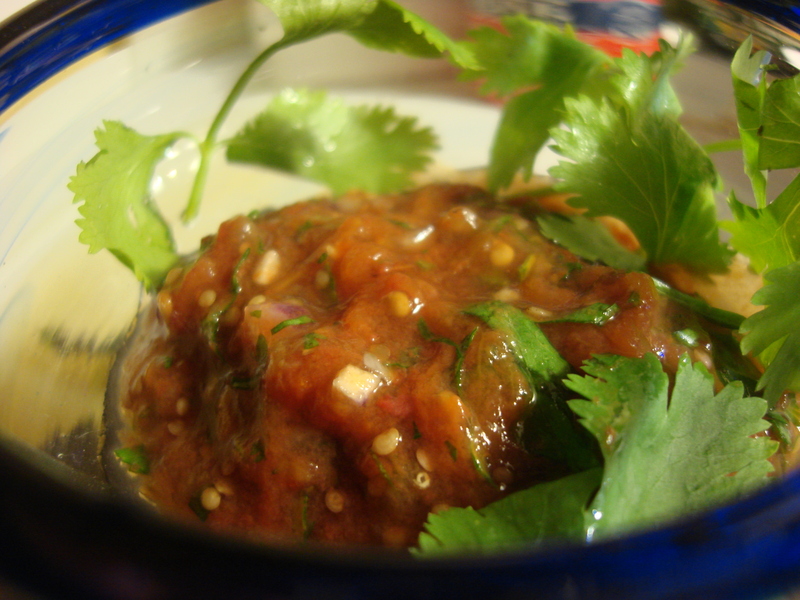 I will be experimenting with grilled peach salsa soon and will let you know! Mix all ingredients except salt in a bowl. Salt to taste. 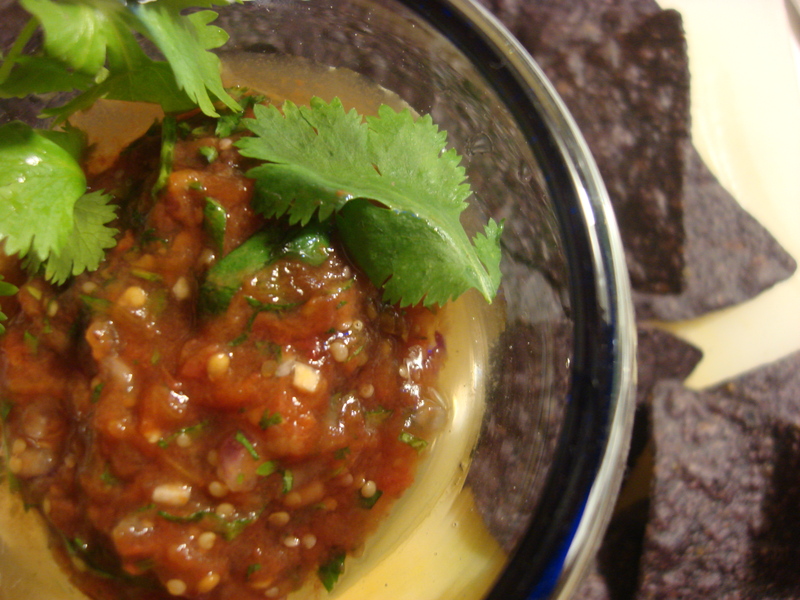 Serve with tortilla chips or as a topping for Southwest style cooked meats. 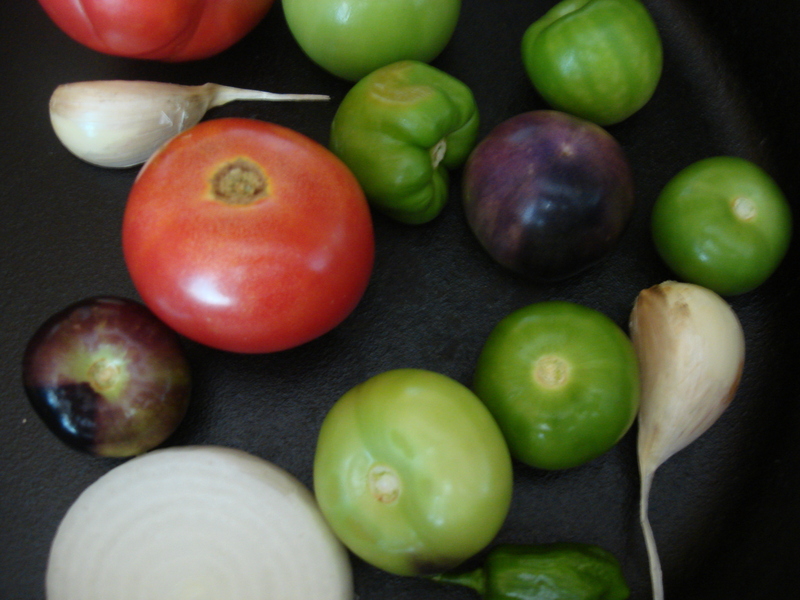 Wanna get roasty flavor from your tomatillos and tomatoes without added oil or turning on the oven? Try pan-roasting, an old Mexican technique that I learned about from Reed Hearon’s La Parrilla: The Mexican Grill (Chronicle Books 1996). It was almost too late for that poor mango, bought in a frenzy of nostalgia for the tree my grandmother planted in her backyard in Mayagüez, a Puerto Rican town celebrated for its delicious, juicy, juicy, sweet, meaty, fiber-free mangos. In June, those suckers drop out of the sky and plop heavily onto the ground where you have to get them before the other critters do. They fall in such quantities that I spent many mornings cutting, slicing, peeling and freezing – you can’t possibly eat them all as they ripen. 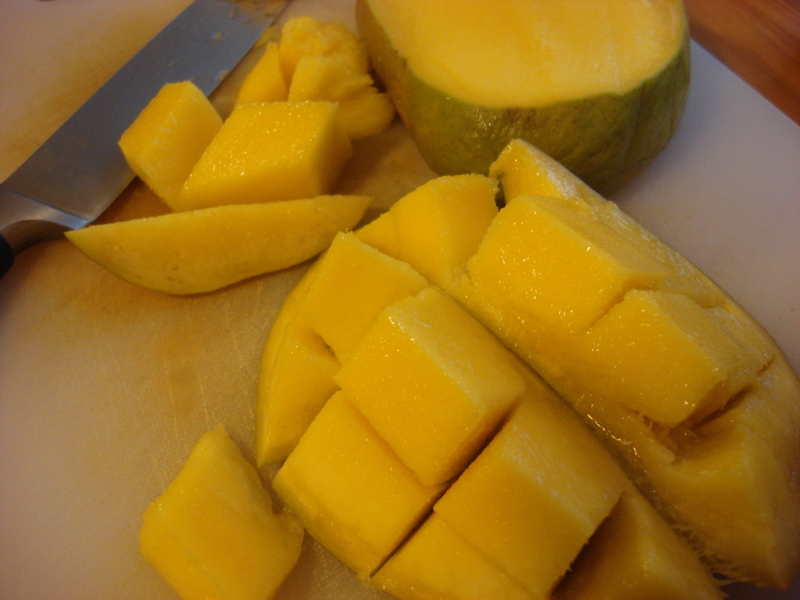 Friends in San Juan used to love to see me arrive with freezer bags full of Mayagüez mangos; they’d have the blender, booze and ice ready for action before I could even lock my car and get to the front door. No such welcoming committee for this mango, even after its long journey from Brazil or Mexico or somesuch warm place, after its boring days in a chilly supermarket produce aisle next to a basket of equally foreign avocados, after too many days in the pale fall light of my southern exposure window, defended from attackers by its only company: several very busy spiders and a valiant Venus Flytrap. No, this poor mango was in dire need of attention and accessorizing, as its best days were behind it. 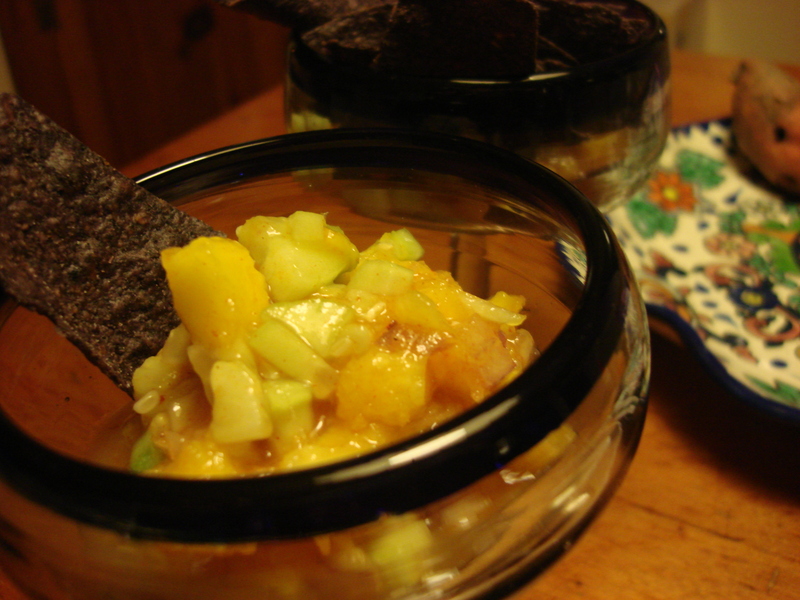 So, Mango Salsa it was, quick and dirty. Good excuse to eat blue corn tortilla chips, which are a weakness of mine (Waterloo to any attempt to get bikini ready) and to further prove that the Spanish love for fruit and cheese is grounded in pure genius and has infinite possibilities. 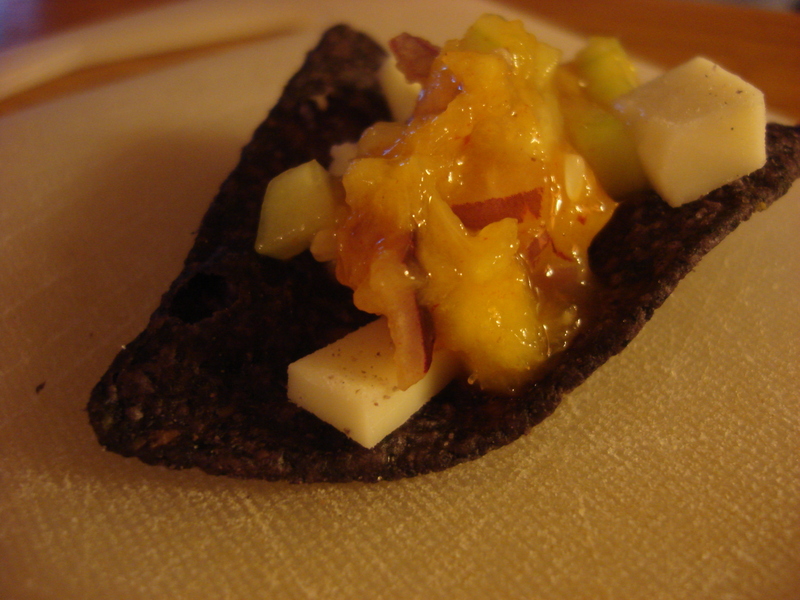 The salsa sweet-tartness and the tortilla crunch just beg to be completed with some salty squeaky cheese – Queso Blanco (the firm kind of Latin white cheese) and Monterey Jack are my choices, but salted mozzarella would likely work also. So here it is – a one bowl operation, served up in a margarita glass, a neglected mango finally loved up the way it should be. Put all ingredients into a small bowl. Mix thoroughly, add seasonings to taste, cover and refrigerate until chilled. Serve with sliced Caribbean white cheese, salted mozzarella or Monterey Jack and tortilla chips.